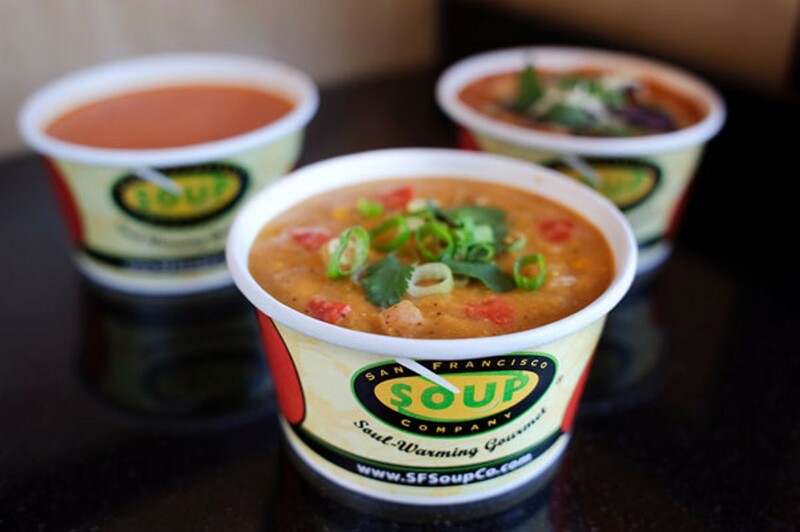 San Francisco Soup Company's soups are portable and delectable. Soup: The original fast food? On a chilly evening, the clam chowder simmers. Through its creamy surface peek bacon nuggets and potato chunks, promising that this is the kind of chowder thick enough to coat a spoon, the kind that cossets and warms you all the way down. Into its depths plunges the ladle, sluicing its contents into not a bowl but a cardboard container. To this container is affixed a snug lid. The container goes into a paper bag, which goes into your backpack, where it rests as you walk half a mile to the bus stop, then endure a jouncy twenty-minute ride, then stroll home. Remove bag. Extract container. Marvel that not one drop escaped. Nor did a drop of your minestrone, your corned-beef-and-cabbage soup, your lobster bisque. The San Francisco Soup Company is many things it's not supposed to be. Soup — to go? A rapidly expanding chain, now sporting sixteen Bay Area outlets, including one in downtown Oakland and another that opened last month on Bancroft Way across from UC Berkeley — whose concoctions taste homemade, as if they had been brewed one loving pot at a time rather than in sufficient quantities to feed all-day streams of students, workers, tourists, and commuters? Soup, which is hot and wet and must be consumed by careful spoonfuls while sitting or at least standing still — as fast food? Steven Sarver, the Harvard Business School grad who founded San Francisco Soup Company ten years ago with his wife, Jennifer, prefers to call it "quick service." Or "fast casual." At the Berkeley restaurant, which has just one table for in-house dining — one of their San Francisco restaurants has none — customers line up along a counter to order salads and wraps as well as soups from a selection of about ten that always includes several vegetarian, dairy-free, gluten-free, and low-carb choices and changes daily, featuring staples such as split pea, turkey chili, and variables such as Creole-crab-corn, broccoli-Cheddar, chicken-tortilla, and chicken-shiitake-bok choy. (The last is Sarver's personal favorite.) 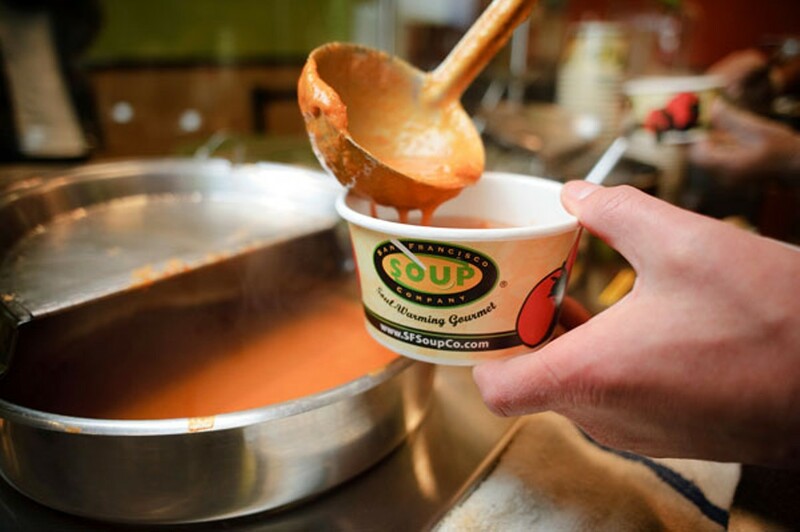 Customers can sample the soups before ordering. Shelves sport prepacked sandwiches and yogurt "parfaits." The Sarvers were inspired by Seinfeld's "Soup Nazi" character, though just typing those words makes me feel cringingly so-last-century. Although neither had any restaurant-industry background, "we just love food," Sarver says. "And we realized that soup is really underappreciated." Although it appears in the cuisines of virtually every culture, "traditionally it's made from leftovers. We thought: Wouldn't it taste even better with great ingredients — say, rather than just potato peels, use the whole potato?" Using organic and locally sourced ingredients whenever possible also became a priority. Discovering a dearth of local soup restaurants, the pair claimed their niche. As they began testing recipes at home and opened their first restaurant in Crocker Galleria, ideas came thick and fast from everywhere. "One day at a friend's house," Sarver remembers, "we were served marinated jerk chicken. And we said, 'Oh, this is awesome, let's make a soup out of this.' Researching key ingredients in Jamaican cooking, we came up with coconut, black beans, and pineapple" — and added another recipe to their retinue, which now tops eighty. So chunky that it's almost a stew, San Francisco Soup Company's organic Southwestern corn chowder — say "yes" when asked whether you'd like the optional fresh cilantro and green onion — is teasingly sweet and unapologetically intense, plying the fun borderline between family-friendly and hey-that's-hot. Demonstrating with his spoon, Tuffy commended its "absolute absence of wateriness," which is a scientific way of saying "thick." Sarver says his chefs — one is a veteran spice expert, another has a French-bistro background, another is a sushi specialist — eschew instant thickeners such as potato starch and flour, using copious meats, legumes, and vegetables to bulk up their soups. Spoons stand upright in the curried lentil, whose hearty potato and carrot chunks balance the soft purée, but whose black pepper crowds out subtler flavors. Fist-sized sourdough hunks, one free per soup and surprisingly fresh, even at dusk, are perfect foils. But am I naughty to have liked our nonsoup items best of all, and the best-best tacked on as an afterthought? Almost enough for two meals, and packed with flavors as bright as its hues — bleu cheese, corn, candied walnuts, organic lettuce, carrots, and the rare shocking-red rapture of roasted beets — the Rainbow Wrap seems designed to cheer the heartsick. Huge crunchy house-made croutons balance feta cheese, sweet red peppers, Kalamata olives, and artichoke hearts in the generous Greek Wrap, whose chewy-salty enthusiasm transports you to somewhere infinitely sunnier than wherever you are. While the egg salad in our prepackaged sandwich was over-puréed to an unnerving paste, the parfait that we seized at the last minute turned out to be one of those eye-openers that you would hire a special chef to whip up at your whim, around the clock, if you were really rich. Berries stud a granola-crowned cup of creamy-sweet vanilla yogurt that does not taste low-fat, but is. Sarver says one of his managers devised the recipe eight years ago: "And McDonald's has it now," he adds pointedly. Subsequent visits yielded further soups: Coconutty, tofu-fortified Thai curry tastes — at least to this Westerner — not like a Western version of an Asian dish but rather like the real thing. Carnelian-colored, cream-enhanced, irresistibly silky tomato bisque has a classic flavor evoking first-class hotel restaurants and railroad dining cars, circa 1936, inducing knock-down-drag-out nostalgia no matter where or when you were born. Tuffy's favorite is the African sweet-potato soup, almost dessertlike in its assertive, indulgent, terra-cotta-colored tropicality, which he pronounced "a wall of flavor, but in a good way." It's fast food. But it's also remarkably real food. And, luckily, we didn't lose a single drop.